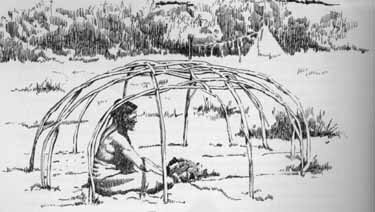 The Sweat Lodge is probably one of the most important Native Rituals. One can heal themselves or the Earth Mother (This represents the womb). 3... a more sophisticated type relying on a heating duct system believed to be of Mayan origin - like a sauna. The "Sweat Lodge" ceremony or ritual usually occurs before and after every other major rituals like the 'Sundance' and Vision Quest. It is a form of healing. It's origional purpose was to cleanse or purify individuals. 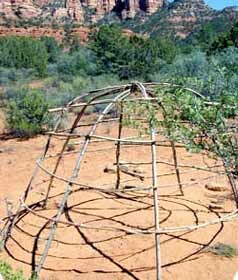 Mother sweat lodge essentially translates into returning to the womb. thus had the ability to cleanse themselves. It was initially a symbolic purification ritual, but has evolved into a healing process . The reason for this is that there are separate views within the community going back to the old ways. Everything is done in the exact same way as in the old days, but veries from tribe to tribe.. Opening prayers are done outside the lodge and the the elder or spiritual guide enters. In our case, as with most ancient cultures, the lodge door faces East as this is where everything new begins. The elder/ spiritual guide enters and sits in the Western door. ( In mixed Sweats) The Woman enter next and move clockwise around the pit in the center of the lodge and sit in the North facing the South. The men then enter and sit in the South facing the North. We all sit on flat cedar bows that are cut fresh every week, or, in modern times, on a carpet or rug, or even animal hide.. The first five stones must be brought in on the pitchfork one at a time. As each enters medicines are put on them like cedar, sage, sweetgrass, etc. each having a very different healing property. The lodge begins to heat up and fill with beautiful smells. The first grandfather (Hot-Stone representing the ancient spirits) that enters is placed in the center to represent the Creator. The first stone is placed as the center stone. The second is placed in the East and touches the center stone. The Eastern direction is the Eagle. The color is yellow and the season is Spring. The East is the spiritual direction and the Eagle is strong carrying our prayers to "Great Spirit." The third rock is placed in the South folowing the same protocol. The spirit keeper is the Coyote or Wolf. The jumping mouse also sits in the south. This direction is the one of love, emotion, community and introspection. The forth stone is placed in the West. The Medicine Bear sits here and represents both the phyiscal strength and healing. The bear brings the healing to the people and is very powerful. The fifth stone is placed in the North. The Great White Buffalo sits here as does the Salmon. This is the direction of Wisdom and of sacrifice. This is where the elders sit. The buffalo and the salmon sacrificed themselves so the people could live and will always be greatly respected for that. In the end all we can offer that is truly ours is our flesh which is why we pierce at the sundance but that is an entirely different story. After the first 5 rocks have entered the next 7 are brought to make a total of 12. The number 12 is very significant. There are 12 moons, 12 tail feathers on the eagle, 12 months and so on. Next the water bucket is brought in and passed to the elder. The door is then closed and the prayers begin. A pipe is passed around. The Pipe holder asks the Spirits to come and join in the smoking of the Pipe. Only men smoke the pipe. Instead, women are touched upon the brow, and this is how they send their messages to the creator. Medicine Women may smoke their own pipes and often have thier own rituals that men cannot perform. Pipe-stone (bowl) and the wooden portion of the Pipe (stem). marriage of Mother Earth and the creatures that inhabit the Earth. This is the main ideology behind the two materials joining and becoming one. The male portion is symbolized as the wood used in the stem. The wood symbolizes the connection between all the living things that inhabit the Earth. The wooden portion joins the stone portion similar to a male joining with the female. They are painted with colors depicting special meanings and feathers, adding an animal presence. Beads are mainly used for decoration but the colors have symbolic value. Each of the 4 round has a different meaning. In the first round they honor and pray for the female aspect of life. In the second round we honor the male aspect. The third round is the healing round and the forth round is the one for ourselves. At the end of each round the door is opened and the next set of 12 are brought in. There are songs, stories, teachings and prayers in each round as well as opening and closing songs. When everything is over the people exit the lodge. It is very important to note that it is a great honor to be invited to a sweat and that this ceremony was given to the First Nations People. Many Native People have now come to a point where thay are willing to included non-natives because the Creator sees no color. The 4 directions are also the four faces of man ie: Yellow, red, Black and White. If you are invited to a sweat it is important to know why you are personally going. hand it to them while you are shaking their hand. The tobacco used in the Pipe is brought by the people who asked for the ceremony. It is their gift for the Spirits to come and guide the Medicine Man throughout the ceremony. Exactly four pinches of tobacco are used and must fill up the bowl at the end of the fourth pinch. These pinches of the tobacco are held out to the Four Directions to call forth the Spirits to accept the offering and hear their plea for guidance. You tell them why you have come. These Elders do this work without charging a fee. No one will every turn away anyone who does not bring an offering. If you go to a sweat go early and offer to help. Watch what is being done and do it. When you come out of the sweat drink lots of water and cool off in the river or ocean depending on where you are. (probably influenza) which by sweating and some potions, they perfectly and speedily cure." 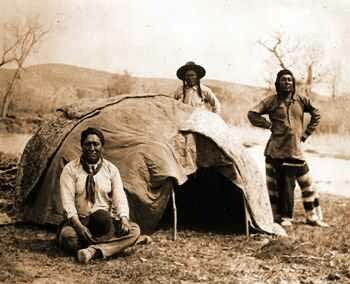 sweat lodges were covered with blankets or skins, while the permanent types were sealed with mud or sod. them on the floor. The Great Spirit then lay beside them and sweated so long that the dolls turned into living people. in the Sky. You will live on the crags and peaks of the highest Mountains. Human Beings will admire you." will kill and eat People, and they will fear you." Turtles and Fish, Sweat Lodge gave names, and the creatures scattered. into his own gait. He stopped short and looked around. Preparation for the sweat bath and its indulgence followed traditional disciplines, often conducted by a medicine man. underground, insulated with dirt or sod with a single tunnel entrance and a small hole in the roof for smoke to escape. prayer and self-denial have long been rituals through which people have found peace of mind. heightens their spiritual and religious awareness. the body, and they can also purify the spirit or soul. on their journey through life. Meditation, fasting and cleansing can enhance the spiritual lives of all people, whether they are Indian or not. The Lodge has to be created in a specific manner, but there are many different building designs used, and each spiritual leader choses the method that helps channel the enegy best. A spiritual leader is not chosen, nor appointed, nor trained to be such a person - A spriritual leader/ Shaman/ Guide, is simply a person with special insights intio the world of the spirits. What they do is to help cure the people spiritually. They know the ways to use the spirit animals to create a balance in a person's circle place. They are guides who do eactly that ; Guide others to finding the correct balance, and they can be of any nation or race. No person holds a monopoly on spirituality. The universe and all within does not belong to anyone but the creator, and native americans can no more claim to be the guardians of the spirits than can Budhists, Catholics, or any other group. When any one race or group tries to claim anything spiritual as their domain, they have fallen prey to their ego.It is ego that prompts various tribes into claiming that only their spiritual guide/ leader or medium is permitted to perform their ceremonies, nothing spiritual belongs to any single person in the community of humankind, and under the eyes of the creator.